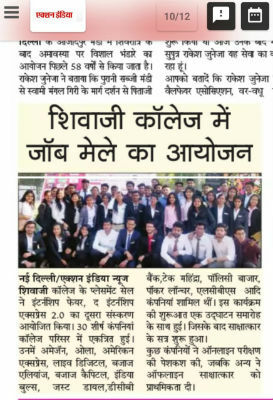 Placement Cell, Shivaji College, with a motive of gratifying the aspirations of budding youngsters is leaving no step unturned to accomplish this mission. The year started on a great notch with a reputed recruiter- EY visited our campus on 20 th September 2018. Handfuls of students were successful in grabbing this life changing opportunity. On 6 th February 2019, Genpact- a famous recruiter was invited to campus to provide various profiles to students from various fields. Followed by Genpact, NIIT also held their recruiting process in the college on 7 th February 2019. Providing the choicest of job profiles and opportunities has always been a top priority for the cell. To achieve this, placement drives have been organised at the company office and also with collaboration with other colleges. On 15 th October 2018 Ken Research held its selection process at their office. Cvent called the students on 8 th October 2018 followed by Edoofa and Alberio. The team was fortunate to have been able to contact Xceedance and S&P to conduct their in- office interview and selection procedure on 16 th and 22 nd January 2019 respectively. POSist recently organised their drive on 8 th February 2019. Inter personal and intra personal skills are equally important to hone one's personality. The Placement Team has identified this need and worked dedicatedly to arrange workshops to enhance personality. Prestigious institute- T.I.M.E. was cordially invited to enrich students with lessons to tackle competitive exams and lot more. Renowned author Stuti Changle graced her presence with her unique art of storytelling. She shared valuable tips about GD and PI. GPREP too organized a workshop for students figuring their careers in the field of defence services. The CEO of Perspectico, Mr. Nikhil Chainani also conducted a seminar on building effective CV and Resume. More offers and opportunities are waiting to be organized and grabbed and the team is high on spirits to make this possible.